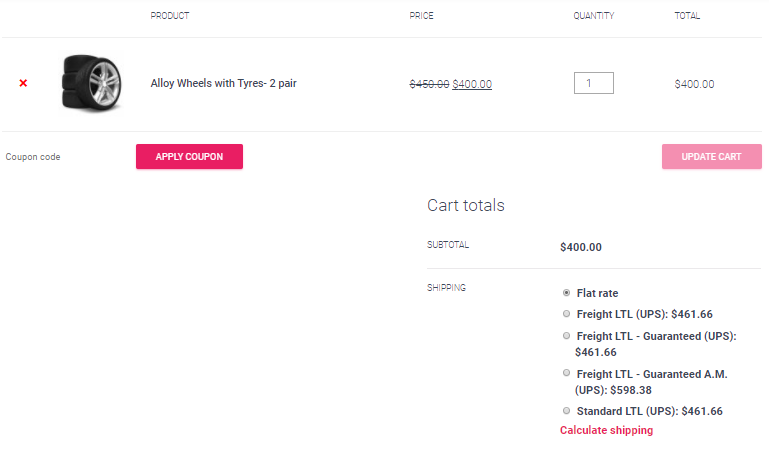 This article will cover how a store owner can configure the WooCommerce UPS Shipping plugin so that his customer should be able to select freight services for their respective product. WooCommerce has emerged as a platform where any person can set up his or her online business. It provides tons of opportunities and tools that help in developing the business and achieving greater heights. One such way WooCommerce helps businesses to grow is by proving the ability to reach out to customers. Delivering products to customers has been an important aspect of any online business. Be it an online art gallery or an automobile modification store, product shipping has its own importance in every business. In such a scenario, say an automobile modification store, where the finished product is bigger in size, shipping takes a different route than usual. One of the ways these heavy shipments are delivered is through UPS Freight Shipping. The idea behind UPS Freight services is to ship packages that weigh more than 150 lbs (68 kgs). These packages can contain a number of products or a single product based on the order. Normally, Freight charges are predefined and the customers have to bear those charges if the delivery is through freight. The best thing about UPS Freight is that the shipping can be delivered through any mode of transportation. Air, water and truck freight is available for these services. Sam is the owner of an Online Automobile Mod store based in Kansas, U.S.A. He has a huge customer base in the US and he even ships custom-made parts across the Mexican border. But the issue with Sam is that the products that he ships cover a wide range. From a small product such as turbochargers and intercoolers, weighing around 30 lbs to the set of custom tires and rims weighing more than 200 lbs, he has to ship everything via UPS shipping services. 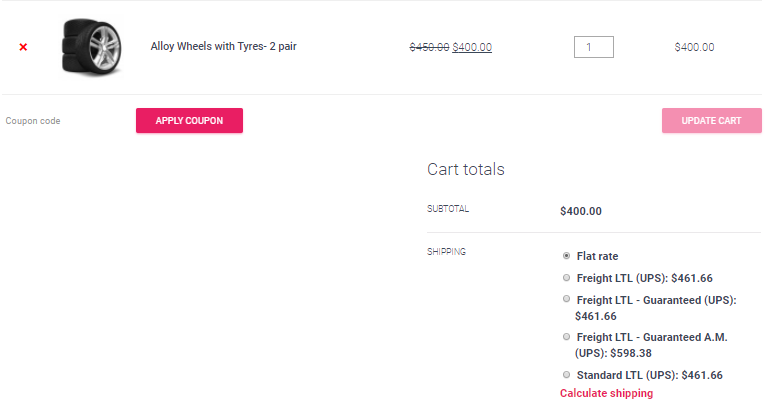 He wanted to configure his WooCommerce store for all those products which don’t cover the weight limits for UPS Freight i.e. 150 lbs. Before going deep into Sam’s issues, let us take a look at various UPS Freight services that help store owners like Sam deliver products to their customers without any hassle. Now let’s discuss these services in detail. LTL stands for less-than-truckload. The store owners can deliver their LTL freight packages through UPS Freight LTL. This service’s delivery commitments are dependant on destination and source of the shipment, along with the service level selected by the store owners. Further, the freight services are available to-and-from all the 50 states of the US, Canada, Puerto Rico, U.S. Virgin Islands, and Guam. This UPS Shipping service lets you know when the shipment will arrive on a certain day. It provides on-time delivery to direct points in the US and Canada, guaranteed. This shipment is available when the shipping is done with a contract or a special pricing other than the current UPS Freight Tariff. The UPS Freight shipping provides guaranteed daytime- definite by noon for all direct points. But this shipping service is limited to selected ZIP codes in the 48 states of the US and Washington DC. But if under any circumstances, UPS Freight fails to deliver any such shipment by the delivery date/time, UPS Freight’s sole liability shall be to cancel freight charges for that shipment upon customer’s request. The UPS Freight shipping provides Standart LTL shipping for all the store owner’s LTL needs. This shipping option is best suited if you want to deliver between the 48 states of the US and Mexico. The Standard LTL offers door-to-door delivery between 3-9 business days based on the source and destination. This is the best option if you are looking for a fast freight delivery across the globe. Worldwide Express Freight, as the name suggests, delivers across more than 60 countries from more than 65 countries in the world. One of the biggest benefits of this service is its guaranteed delivery by the end of the day. But this guarantee varies continent to continent. As it offers, next business day across Canada, two business day delivery to Europe and Latin America and two to three business day delivery across Asia. Sam’s issue can be easily solved using WooCommerce UPS Shipping plugin. All Sam needs is a shipping class that will contain all the products with weight less than the freight limit, 150 lbs. 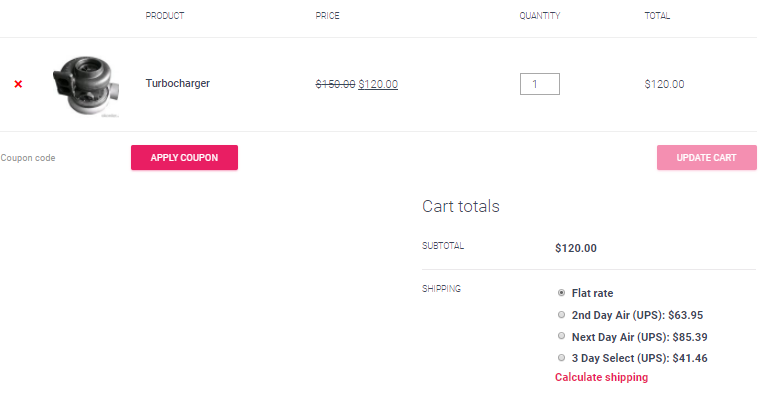 After configuring the shipping class, add products to this shipping class. This shipping class, Small Products, have certain products that weigh less than 150 lbs. Now to optimize UPS shipping plugin for freight services, you need to add a code snippet which you can get from this link. For reference let’s check out what happened in Sam’s scenario after making all these changes. As you can see, the Freight Services are available for this product based on its weight. 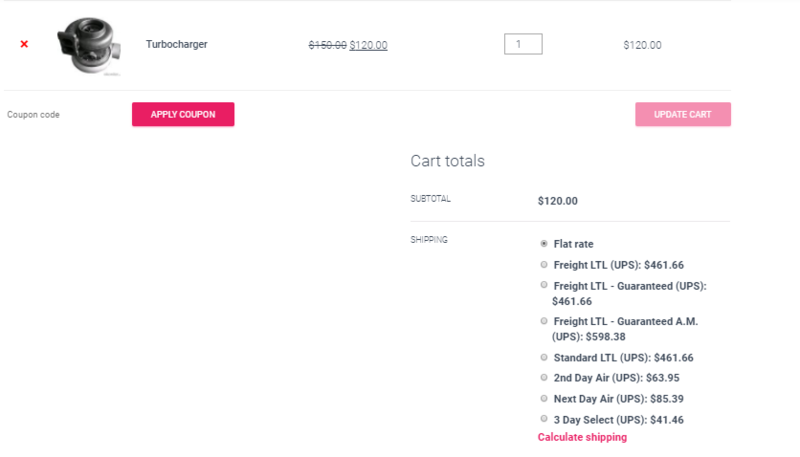 But after adding the code snippet, Sam’s customers will be able to see different UPS Shipping services based on weight and the shipping class that they are a part of. Take a look at below screenshot. Like earlier, it shows a product with valid Freight Services enabled. But for the product shown below, is in the Shipping Class, only standard services are enabled for this product. This was all about the UPS Freight shipping services and how you can customize your WooCommerce store according to the product weights for accommodating the UPS Freight Services. If you have any queries regarding customizing WooCommerce UPS Shipping plugin for the optimized working of your online store, based on your business case, feel free to write to us or share your views in the comment section below.